Well hellllllllo there and happy Wednesday to you!! So as I sit down to write this post I’m cuddled up on the couch with my three year old while she watches Anne of Green Gables, which she’s basically obsessed with right now. And even though I’ve seen this movie about 39,282 times, I can’t stop watching it. Seriously, it gets me EVERY. SINGLE. TIME. It’s just too good. It always makes me wish for simple days in the countryside surrounded by big gorgeous farmhouses and rolling hills. Ahhh doesn’t that sound so nice?? Good ol’ Anne Shirley, I’ll always love her. You know what else I love? 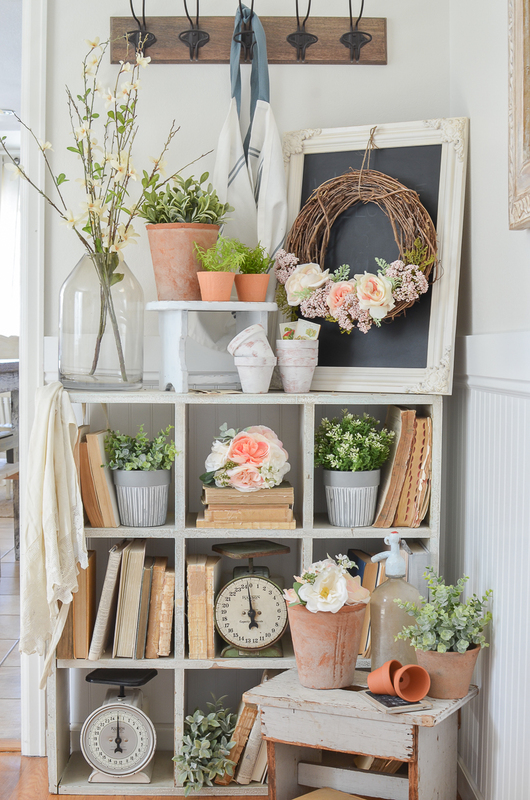 Spring decor! I’ve been having so much fun lately adding little pops of color to our home for spring and it just makes my heart so happy. 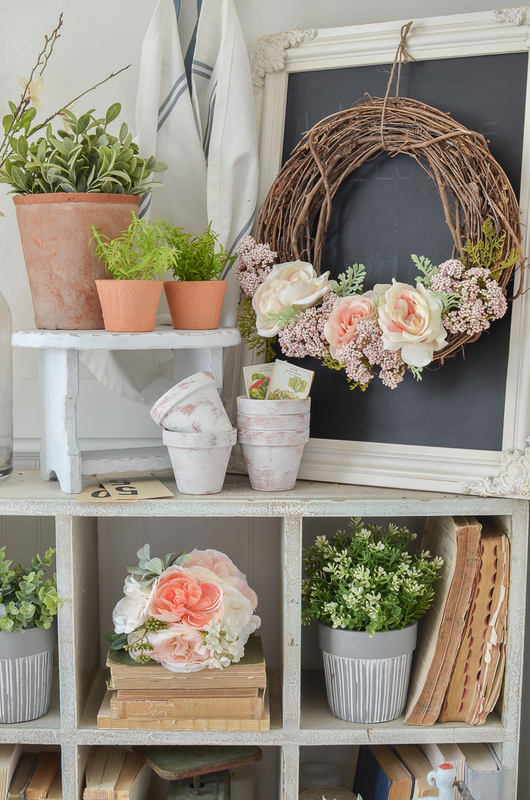 I actually didn’t plan on doing a ton of spring decor this year, but once I got started with a few bits here and there, I just couldn’t stop. Next thing you know I’ve got flowers EVERYWHERE. Eeeesh. But at least it’s pretty around here, right?! 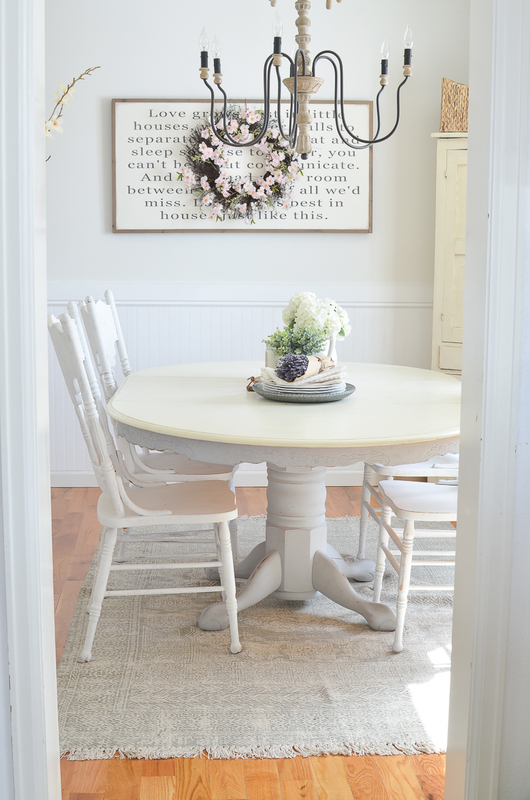 I added some fun pops of spring color to our dining room and I wanted to share it with you fabulous folks today! I recently picked up a new rug for this room and so far I am really liking the change. I had a jute rug in here before, which I loved, but I wanted something with a bit of color. This one is soft gray and it has a really pretty vintage design to it. 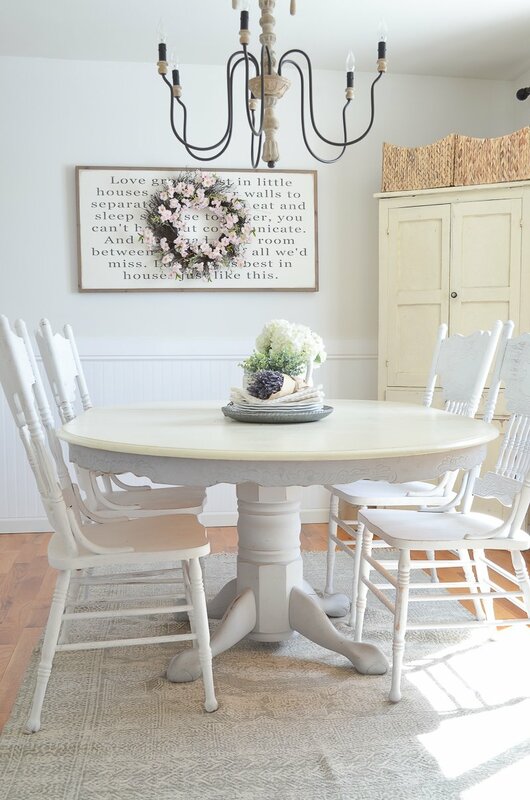 It is a bit thin, so it’s definitely not something you’d want to put in a living room, but I think it works perfectly under my chalk painted table and it almost kinda matches too! I’ve said it before and I’ll say it again, but spring and summer are hands down my favorite seasons. I know everyone is all crazy about Christmas, and that’s great too, but spring is when my heart starts to sing. I know that sounds cheesy as heck, but it’s true. 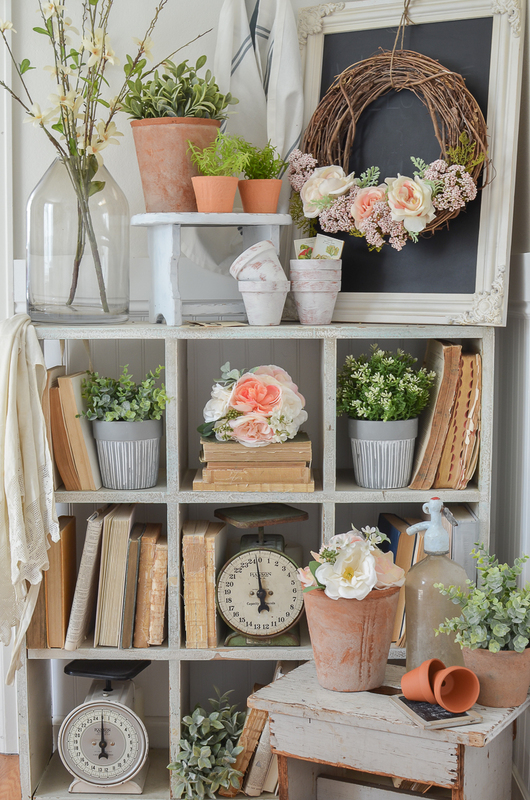 I just love adding lots of greenery and flowers into our home–faux or real, I’ll take them alllllllll! 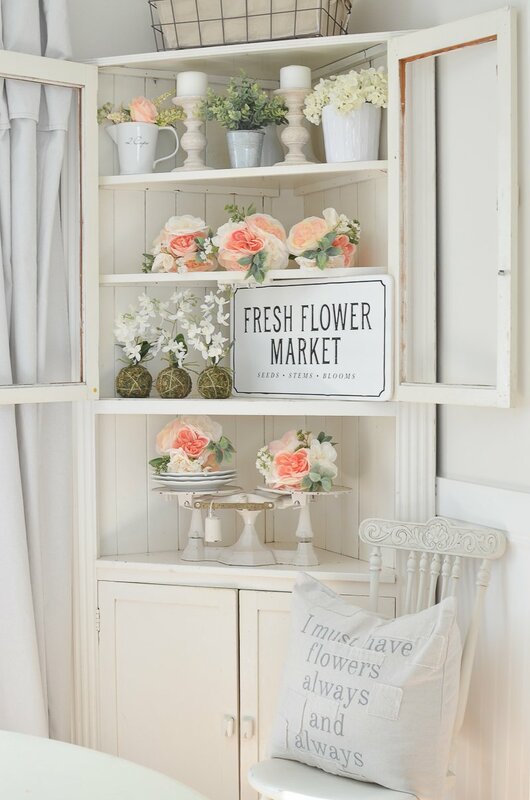 I loaded this antique corner cabinet up with the prettiest faux flowers (from Michael’s) and I’m pretty much obsessed with this corner now. 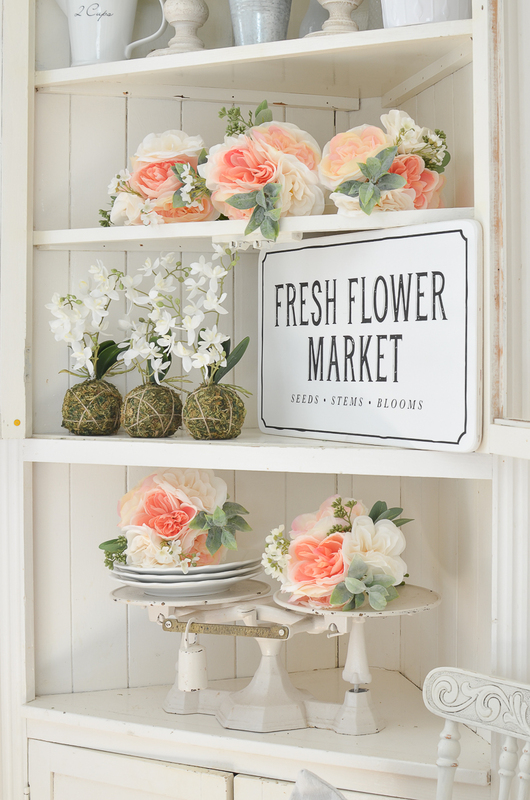 That fresh flower market sign was one of my finds from our trip to Magnolia Market, but I found lots of similar ones here. I had so much fun styling this sign all over our home last spring and summer–I’m sure it will be moved a zillion times again this year! You know I had to add a bit of color to this corner too. I really didn’t do much, just a simple DIY floral wreath, a few pots, and a couple flowers. 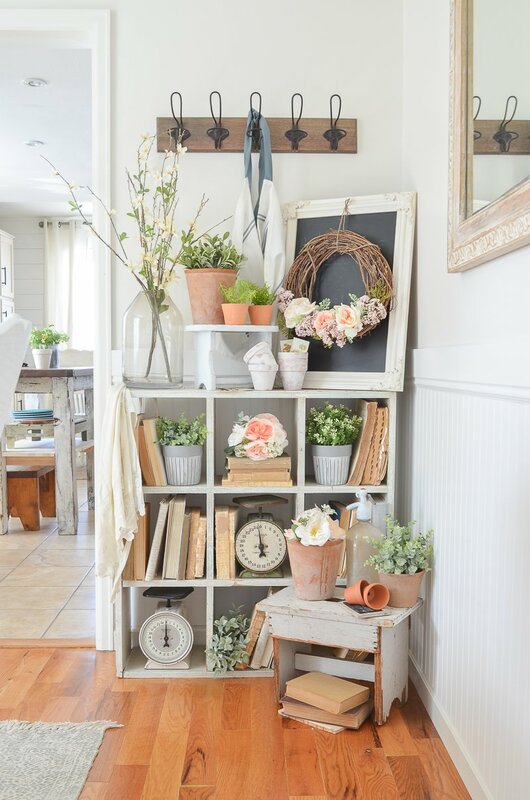 Easy peasy spring decor. This room is pretty simple and it’s a small space, but it’s always full of sunshine and it just makes me so happy. I wish we used it more often, but the truth is we rarely eat in here. 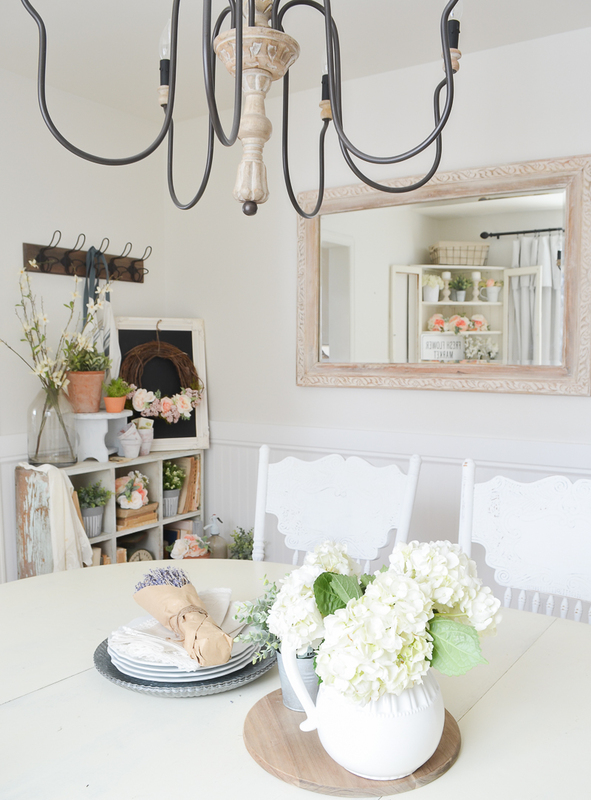 Most of the time we eat our meals in the breakfast nook, but I’m still grateful to have a dining room to decorate with pretty things. And I can’t help but think about how far this room has come over the past two and a half years. It’s seen some big changes and it slowly gets better and better as time goes on. And isn’t that the truth for our homes in general? Little by little they slowly become a reflection of who we are and what we love. It’s such a fun process! So pretty Sarah!! 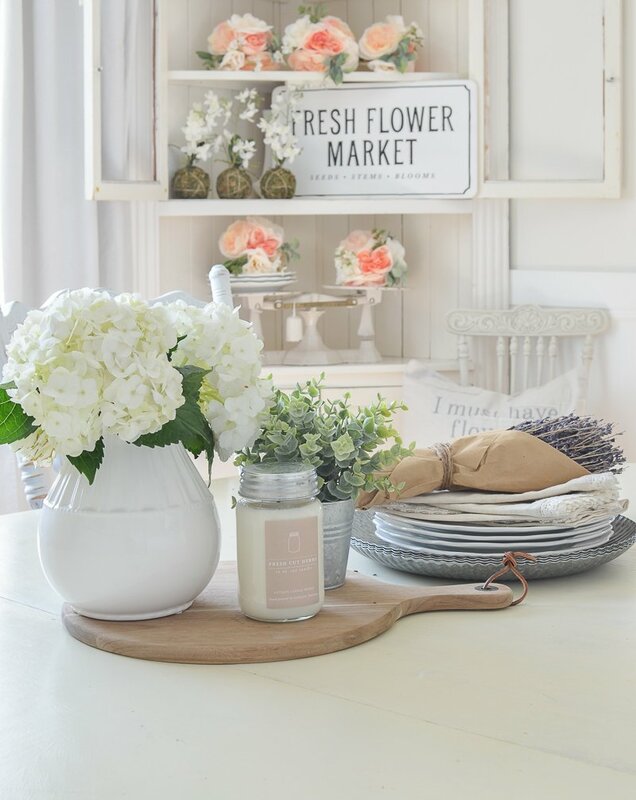 With the cold dreary weather we’ve been having lately, it was nice to see your Spring decor. Really lifts the spirits! And I really love your white scale. I hope to find one in my antiquing adventures. I love Anne of Green Gables too! Have you watched Anne with an E ??? If possible, Anne get even better! I highly recommend it if you haven’t! So beautiful and all spring. Loving all the sunshine. So beautiful! Love the coral-ly peach colors. Hey! I was just looking at somethings here in pinterust and was like I know that bookshelf!! !I follow you on Instagram and now I can on Pinterest! I love your ideas and even got my daughter to make curtains like yours!!! 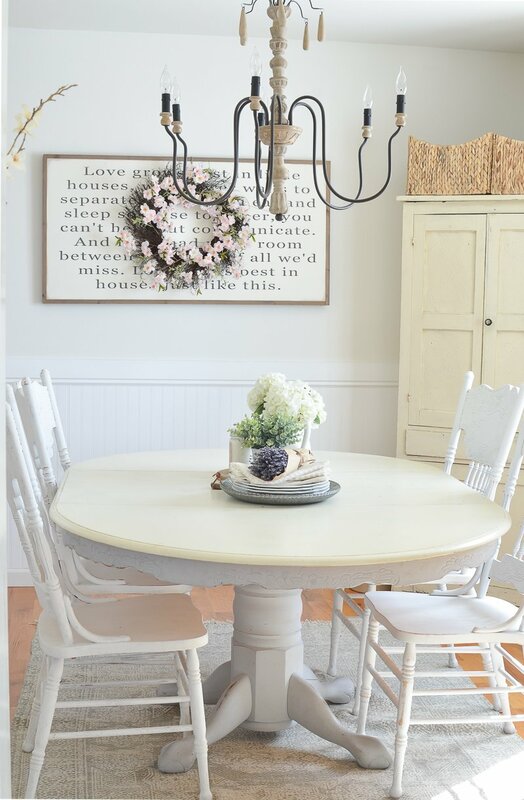 What a sweet shabby chic pedestal table. A cozy space for a meal together. 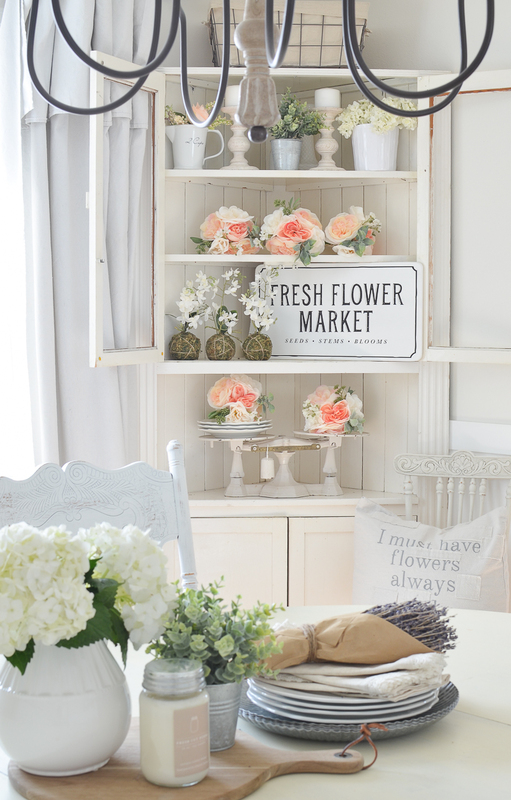 So pretty and with the touches of spring, very inviting. So glad I came across your blog as I was searching for my daughter on fb sarah joy boyko. Isn’t it funny that you even look a bit like her. Love your poise young lady and wish you all the success and wellness a life with God can be!